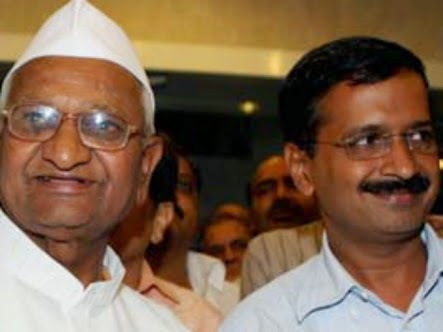 New Delhi : Delhi Chief Minister Arvind Kejriwal on Tuesday joined social activist Anna Hazare on stage in his protest against Land Acquisition Amendment Bill in the national capital's Jantar Mantar. 50 others organization include in the protest. Kejriwal was seen taking a seat in the front row. But whether he will join Hazare on stage cannot be ascertained now. Hazare is holding a farmers' protest in the national capital against the introduction the proposed changes to the bill in the Parliament. Earlier on Monday, he also threatened to launch a law violation movement against the Land Ordinance, saying there was no difference between the Narendra Modi government and the previous one, led by the Congress. He says the government has not taken into the account the opinion of the people and the farmers. "Small farmers and women in villages don't know what this law is. We have to start a padyatra in every village and district to enlighten them," he said. He earlier had flagged off a march from Haryana to New Delhi against the Land Acquisition Bill brought by an ordinance of the BJP-led government in New Delhi. "Around 5000-6000 farmers have gone on the padyatra and will reach here. More people will reach this place. This andolan will grow. "We request the government to withdraw this law and bring back as well make additions to the 2013 law," Anna had said. Assailing the NDA government for the ordinance that made significant changes in the Land Acquisition Act, the septugenarian leader said the act was similar to that of the former British ruler. "This is land grab by the government, Britishers used to do this. What is the need to bring in ordinance when Act was passed in 2013. To cater to the industrialists, how can you betray the farmers?" he had said.